World Without End may take a little while to get going, but once it does, it becomes an absorbing and entertaining miniseries. It comes to Blu-Ray in excellent quality that allows all of the period details to shine through, making this a release worth checking out. Merely two years ago, Ken Follett’s The Pillars of the Earth was brought to the small screen in an outstanding epic miniseries. It featured a fantastic mix of drama, romance, war, corruption, revenge, mystery, and political intrigue, all centered around the building of a cathedral in the fictitious English town of Kingsbridge. Now Follett’s “sequel” novel, World Without End, has been given the miniseries treatment, bringing us once again to this small town where we find that many of these same elements are still brewing, even 150 years later. As this is a six and a half hour miniseries, there is quite a bit going on, so I’ll do my best to lay down the most important storylines. Set in the 1300s, the main storyline revolves around Caris (Charlotte Riley), a resident of Kingsbridge who has decided to study medicine from Mattie (Indira Varma), a woman who is not trusted by many because of her “strange” medicinal methods, despite having healed many. Intertwined with her story is that of two brothers: Merthin (Tom Weston-Jones) and Ralph (Oliver Jackson-Cohen). Near the start of their story, they duel for the chance to become a squire to a local lord, while the loser of the match becomes a builder’s apprentice. Ralph, being the better fighter, wins, leaving Merthin the apprenticeship. Merthin eventually falls in love with Caris, only to be forced to leave her when she is forced to enter the church under penalty of being burned as a witch. With her new position, she continues to heal the sick. 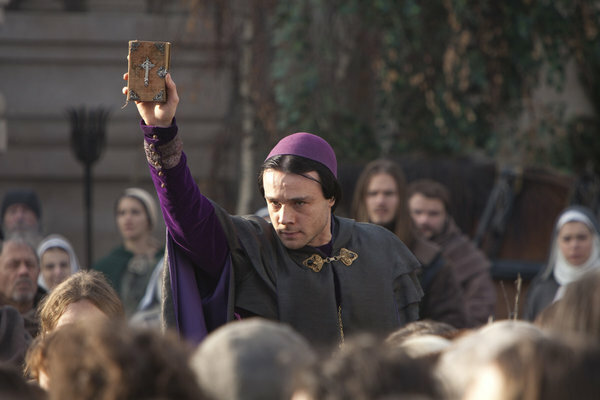 However, with the help of Mother Cecilia (Miranda Richardson), she must also contend with the wicked Prior Godwyn (Rupert Evans), who will stop at nothing to get himself a palace built. 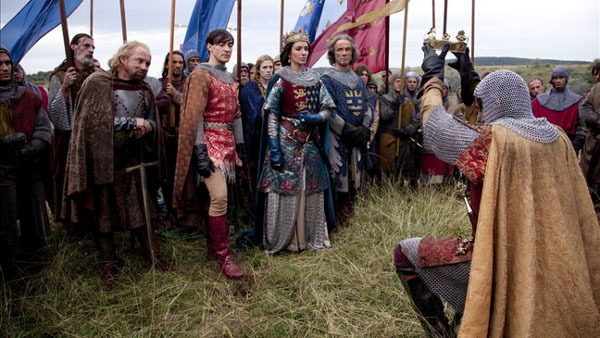 Meanwhile, Queen Isabella (Aure Atika) has tricked her son, King Edward III (Blake Ritson), into going to war with France in an attempt to claim the French crown. In order to fight this war, Isabella steadily raises taxes over and over, forcing more and more hardship on the people of Kingsbridge, a town that she has a personal grudge with. That should be enough of the plot to understand what kind of story we’re dealing with here. You may have noticed that I put sequel in quotation marks at the top of this review, which is because, while this is called a sequel, other than the locations, there’s not much else tying it to The Pillars of the Earth, which is certainly not a bad thing, though it is a bit misleading. Right off, I have to say that this is not as strong as the previous miniseries, and I think the key reason for this lies in the storytelling method. Whereas the previous miniseries had taken its time in introducing all of the key players and in laying out the storylines that we would have to follow for several hours, World Without End seemed to be in a rather big hurry to get everyone introduced and the storylines moving. This leads to a bit of confusion as to who is who and what they’re doing in their story as the miniseries rushes forward. This isn’t Cloud Atlas where multiple stories have to be introduced quickly. They have the next six and a half hours to fill us in on the stories, so there’s not much reason for the rush. However, because of this, it took a while before I was able to get situated with what was going on with each character. Unfortunately, this also leads to a slight feeling of indifference, though this luckily doesn’t last. About halfway through, the series finally gets its footing, having gotten the stories going in full motion. This is where it actually becomes compelling for the most part, though it was rather strange to have almost the exact same antagonist from the previous miniseries (a corrupt member of the Kingsbridge priory). The stories begin to weave together in such a way that that feeling of indifference starts to fade, leaving you wondering what’s going to happen next as Caris and Godwyn continue to lock horns, while other events threaten the very existence of the town. Having never read the book, I can’t tell you just how well it’s been adapted, but I can tell you that it’s been made to look very authentic, right down to the smallest detail. The costumes, sets, props, and locations add to this authenticity, which becomes even more impressive when you remember that this was made for TV. Speaking of the look, the miniseries has been brought to Blu-Ray in an impressive 1080p, 1.85:1 transfer that allows for the attention to detail to shine through. Likewise, there was no difficulty with the 5.1 DTS-HD Master Audio. It’s crisp and clear, allowing for everything to be heard just as it should be. As far as the special features go, you only get one featurette, which is called “The Making of Ken Follett’s World Without End.” This is basically a 24-minute overview of how the miniseries was brought to life. Unfortunately, since it’s an overview, they are very brief in multiple areas, not going into much detail regarding how the series was adapted from Follett’s novel or how the whole thing came about in the first place. There are some interviews with Follett and the cast/crew, but again, they are very brief and don’t really get into much detail about their respective duties. It’s not a terrible “Making of,” but as I’ve mentioned, this is a six and a half hour miniseries. There are plenty of topics that they could have talked about, ranging from pre-production through post-production, that would have made for a fascinating, more in-depth “Making of” featurette.” At the very least, they did try, and we do get to learn a little bit about how this epic miniseries was put together. Overall, this is a pretty good Blu-Ray release for this epic adaptation of Ken Follett’s novel. It may have taken a little while to get into, but it eventually hits its stride and becomes a rather engaging set of stories, so if you give it a little time and stick with it, you could very well find yourself engrossed with these characters as well. I would have liked to see more in-depth special features, but this Blu-Ray still warrants a recommendation for the miniseries and the outstanding quality alone.